Thanks for your interest in biologically pure restructured alkaline water. This water is a super antioxidant and will help cleanse your body of acidic waste products on a daily basis. Drinking this living water will also help your body to overcome the three leading causes of premature aging, sickness and disease: Acidosis, Dehydration, and Free Radicals. Following the recommended startup should allow you to avoid any negative detoxification side effects. Detoxification side effects could include a slight headache and light flu like symptoms which would normally pass very quickly. Drinking the alkaline water must become a daily habit in order to receive the full health benefits. The benefits will vary from person to person. Start drinking TODAY and enjoy the benefits as time goes by! Following the startup period continue drinking half of your body weight in ounces every day in order to receive the maximum health benefits from the alkaline water. Example: A 128 pound adult should be drinking approximately 64 ounces per day. One gallon is 128 ounces. DO NOT take medication with the alkaline water! Because of the smaller molecular structure and permeability of the water, medication could have a greater affect on the body. Continue taking your medication as before. Drink the alkaline water up to 1/2 hour before taking the medication and only after 1 hour after taking the medication. This is particularly important for heart medications. After you have reached your goal of drinking half of your body weight in ounces for several weeks, you will want to begin drinking Level 2. Note: When changing levels, if you notice a headache, light-headedness or stomach problems, drink a glass of level 0, regular tap or spring water. This will neutralize the problem. Not everyone's metabolism is the same; therefore, the higher alkalinity could affect individuals differently. Typically most women will be comfortable using level 2 and most men will be comfortable with level 3. Level 4 should not be consumed on a regular basis, its use should be for athletic or therapeutic purposes or as directed by a practitioner. What is Restructured Alkaline & Acidic Water? Restructured Alkaline and Acidic water is the result of an electrolysis process. This process is actually electrifying the water between two points: a cathode, a negative conductor and an anode, a positive conductor. The result of this electrical charge is separation and concentration of alkaline minerals and acidic minerals. The alkaline water contains the alkaline minerals which are potassium, magnesium, calcium and sodium. The acidic water contains the acidic minerals which are chlorine, fluoride, lead, sulfur and phosphorus. Another process also takes place during this electrolysis. The alkaline water molecule structure (groups of H20 molecules) size is reduced from approximately 11 clusters to 5 or 6 clusters. This smaller water is referred to scientifically as "Electrolyzed Reduced Water," and commonly referred to as "Restructured Alkaline Water". This alkaline water is full of negative hydrogen ions as a result of the molecular restructuring. This is what gives the alkaline water the super anti-oxidative property and its ability to be an active scavenger of free radicals within the body. Its restructured size gives it great permeability in the body allowing it to cross cellular barriers, limited by normal water, providing maximum hydration. The smaller molecular size gives increased permeability and effectiveness for nutritional supplements and prescription medication. This explains the notification for "People on Medications" that is found previously in the Startup Recommendations. The alkaline water has an oxygen reduction potential (ORP) rating which refers to how much anti-oxidation it can perform. This relates to the relative pH of the water and as you drink it, determines its effectiveness as an anti-oxidant in your body. The higher the pH provides more oxygen reduction potential and the higher its potency as an anti-oxidant within your body. Over time, the alkaline water has the ability to turn your tissue into an alkaline state and dissolve acid formed matter such as kidney stones and gall stones within the body. The alkaline water has a pure clean taste, is easy to drink and sometimes referred to as a "wetter water" due to its smooth texture and reduced molecule structure size. The smaller molecule structure size allows the water to boil in about half of the time as regular water, making it an excellent water for cooking. The faster heat conduction keeps the flavor in the food and not in the water that is drained away. The acidic water, used for external purposes only, is scientifically referred to as "Electrolyzed Oxidizing Water" and commonly referred to as "Restructured Acidic Water." As mentioned, the electrolysis process separates and concentrates the acidic minerals. The acidic water which contains oxidizing and positively charged chlorine and hydrogen and their derivatives. These are beneficial for their cleaning, sanitizing, disinfecting, bleaching, germicidal and topical healing properties. For the consumer, applying topically to skin injuries or irritations may speed healing and provide protection from further infection. Using acidic water for most plants will allow them to thrive. Acidic water used for cleaning in the kitchen provides disinfecting for utensils and food preparation surfaces. Regular consumption of alkaline water improves regularity to the body. Unlike tap water you can drink large amounts of alkaline water without bloating or stomach upset. Ideally, you should be drinking a minimum of 1/2 of your body weight in ounces per day and refrain from consuming excessive amounts beyond this goal or just prior to bedtime. Compared to the conventional methods of beverage preparation, using Alkaline water will result in less coffee, tea, and juice concentrates being used. This is due to the greater absorption and permeability of water. The color of tea is vivid, its astringency is lessened making it mellow and delicious. Coffee acidity is reduced imparting a strong aroma and smooth yet rich flavor. Preparing juice from concentrate, with alkaline water reduces the acidity, extends the shelf life and maximizes the fruit flavor. Juice preparation with a level 4 alkaline water allows for maximum acid reduction, preservation and compounds the antioxidant properties. Using alkaline water for cooking and food preparation allows you to minimize cooking time and maximize flavor. This is because of the smaller molecular structure size of the alkaline water, its permeability and its transfer of convection heat. The alkaline water will boil in half the time compared to regular water allowing food to be fully cooked in minimal time. A. Vegetables - Steeping, washing, boiling or steaming with alkaline water allows the vegetables to retain the chlorophyll keeping the color vivid, minimizing harshness, maximizing flavor and makes them easier to digest. B. Red Meats & Liver - When liver and red meats are steeped in alkaline water for 20 to 30 minutes, the blood is drawn out and odors are eliminated. C. Fish - Cooking with alkaline water allows fish to remain moist, firm and keep its flaky texture. D. Beans & Rice - Steep beans for 1 to 2 hours before cooking, depending on the size. Cooking both rice and beans with alkaline will extend their refrigerated shelf life. A. Animal and Pets - Using level 1 alkaline water for pets should maintain health and result in reduced feces odors and a healthier coat, fur or feathers. B. Plant and Flowers - Although most plants will thrive with the use of restructured acidic water, cut floral arrangements and certain non-rooted plants will live much longer and keep their fresh cut appearance longer. Because of the acidic water's astringent effect and constricting action it will tighten and smooth the skin when it is used for face washing and bathing. Acidic water is also effective in the treatment and prevention of acne and other skin blemishes. A. Washing the face - Washing with acidic water makes the skin smooth, improves its complexion, and reduces make-up irritation. B. Shampooing - Using the acidic water to rinse your hair before and after shampooing, will protect the hair, minimize hair loss, reduce or eliminate dandruff and leaves your hair soft and shiny. C. Shaving - Shaving with the acidic water protects the health and beauty of the Skin, gives a clean and fresh feeling after shaving, protects from shaving rash and works as a styptic. D. Bathing - Place two to four gallons of acidic water in the bathtub. It is effective for overall beauty and the health of your skin. E. Body wash - Wiping the body with a towel that has been steamed in acidic water is effective for overall beauty, complexion and health of your skin. Due to the slight disinfecting and sterilization properties of acidic water it has an analgesic effect on the skin and aids in the healing of mouth and throat sores as well as injuries and irritations to the skin. A. Gargling - Gargling with acidic water prevents infection by germs including the microbes that cause colds and tonsillitis. C. Eczema, chapping and other skin problems - Accelerates recovery when applied directly with a wet compress or sprayed onto skin. D. Wounds, cuts, and abrasions - Applying the acidic water exhibits a disinfecting and styptic action and accelerates recovery. E. Toe Fungus and Athletes Foot - Soaking with acidic water 3 times daily prevents spread and speeds recovery. F. Bruises and Sprains - Applying or soaking 3 times daily speeds recovery. A. Fruits & Vegetables - Washing and processing of colorful fruits and vegetables, with acidic water, allows the brilliance of the fruits and vegetables to shine. This is due to the slight bleaching action of the acidic water. Also, the slight sterilization action of the acidic water helps to eliminate bacteria found on the surface. B. Boiling Eggs - Boiling eggs with acidic water allows the white of the eggs to remain intact even when the shells crack during boiling. Additionally, the yolk will stay centered in the middle of the egg. C. Beans & Peas - Colorful beans and peas and similar legumes are cooked quickly with the acidic water allowing the natural brilliant appearance to remain intact. D. Fish - Rinsing and soaking certain fish tightens filets and helps to eliminate bacteria due to the slight sterilization effect. E. Hand washing - Washing hands with acidic water eliminates bacteria, food odors and itching. It also will leave hands softer and eliminates chaffing. A. Household cleaning, Vehicle washing & Polishing - Due to the bleaching and disinfecting properties of acidic water it is useful as a base water for removing dirt and grime from a variety of household surfaces. Also, less cleaning solution is needed when using acidic water as a base cleaning water. Acidic water is also effective for cleaning and polishing mirrors, eyeglasses, glass, stemware, and silverware. B. Kitchen cleaning - Acidic water provides disinfecting properties that are useful in the kitchen as well. Cutting boards and utensils are quickly cleaned and disinfected when cleaned with acidic water. Pots and pans that are soaked overnight in acidic water will lose stains and burns from baked on food. Dish cloths using acidic water will not harbor odors from bacteria and fungi. C. Pet care - Bathing pets in acidic water leaves the coat lustrous and shiny. It prevents itching and skin disease. D. Art & Painting - Water based paints and canvas work is preserved and quality of adherence is improved. The ALKALIZERTM is the product of an innovative technology that filters and then changes tap water into a liquid antioxidant through an electrolysis process. This process produces two types of water: one is alkaline which is used for consumption and the other is acidic for external and topical applications. Each of these waters has unique properties that can enhance the quality of our health. Alkaline or Acidic water is selectable by 4 different levels of alkalinity and or acidity depending on the use. 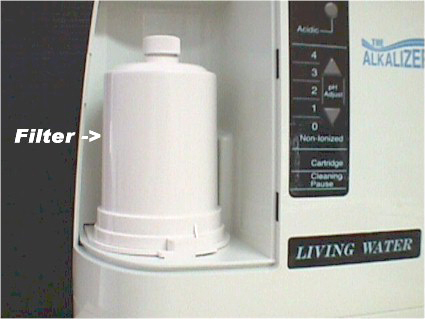 A computer built into the unit constantly monitors the pH setting assuring that the alkaline water is the same regardless of changes in the water source which can vary from day to day or city to city. The ALKALIZERTM is manufactured in Japan and has been awarded for being the "best electronic medical device" in Japan. It is also certified by the Japanese Ministry of Health as a regulated medical device. Connecting and using The ALKALIZERTM is simple and easy! Several adapters are provided to connect directly to the faucet by simply unscrewing the aerator. The filter will need to be replaced every 12 to 16 months and is a simple twist and lift procedure. A full FIVE YEAR WARRANTY is included and 45 Days Money Back Guarantee. The ALKALIZERTM is superior in its performance and longevity. This is due to the special patented panels used on its electrolysis chamber. There are three special, ultra-smooth platinum and titanium panels which are coated twice with platinum and baked on. A coat of platinum, then titanium, then platinum again which are each individually baked on and extremely smooth. Corrosion, pitting, and deterioration in the chamber is non-existent in The ALKALIZERTM. Factory testing of other machines clearly revealed why the performance and results are not the same. Side by side tests revealed the following. After just 8 months of use, there was no sign of deterioration in the patented electrolysis panels used in The ALKALIZERTM. The less expensive and more expensive competitor's model showed there was significant pitting and corrosion after just 8 months of use allowing the potential for heavy metal discharge into the alkaline water. Additional testing showed the Oxygen Reduction Potential (ORP) at the lowest setting for both machines. The ALKALIZERTM proved to have a lower ORP compared to the other machines. The following information outlines books, university and clinical studies by professionals relating to both alkaline and acidic water. Remember that the scientific reference to alkaline water is Electrolyzed Reduced Water and the reference to acidic water is Electrolyzed Oxidizing Water. Electrolyzed-reduced water scavenges active oxygen species protection DNA from oxidative damage. Treatment of infectious skin defects or ulcers with electrolyzed strong acid aqueous solution. Inactivation of Escherichia coli and Listeriaon plastic kitchen cutting boards by electrolyzed water. Fundamental studies on crop disease control by spraying electrolyzed strong acid water. Your Body's Many Cries for Water - by F. Batmanghelidj, M.D. The Calcium Factor - by Robert R. Barefoot & Carl J. Reich, M.D.